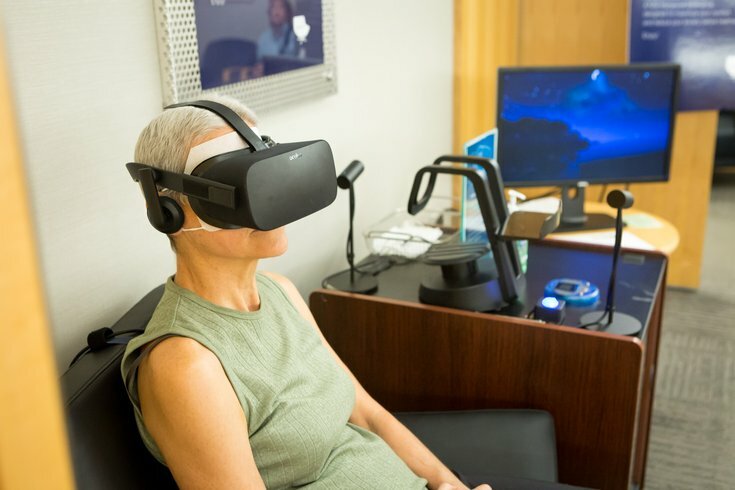 Cancer patient Margy McCook, of Blue Bell, Montgomery County, uses a virtual relaxation machine in the waiting room at Penn Medicine's Roberts Proton Therapy Center in University City. Doctors say VR can be used to reduce the stress and anxiety patients face when they visit a hospital for treatment. The first time Margy McCook arrived for radiation treatment, she took her mother for support. She also brought a slew of nerves, fears and anxiety into the waiting room. "The thing that I was thinking the most is, I am consenting to somebody radiating me," McCook said. "Your whole entire life you've been told radiation is bad and to avoid it. That's scary." McCook, 54, of Blue Bell, Montgomery County, was diagnosed with triple-negative breast cancer in late January. She began radiation treatments at Penn Medicine earlier this month. McCook's mindset was hardly unique among cancer patients. But an upstart technology could help reduce the stress and anxiety that so often accompanies the treatments. One month ago, Penn's radiation oncology department added a virtual reality experience to its waiting room at the Roberts Proton Therapy Center. Instead of nervously thumbing through outdated magazines, patients can escape to a far more serene setting by simply putting on a headset. 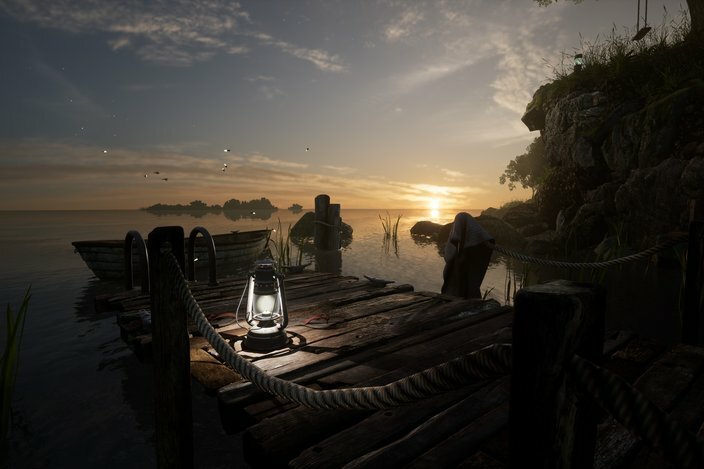 Virtual reality (VR) is an interactive computer-generated experience within a simulated environment that incorporates mainly auditory and visual feedback. Penn Medicine patients find themselves on a wooden dock resting atop a secluded bay. For nearly 10 minutes, they watch the sun rise over the horizon as gentle waves splash against a wooded hillside. Stars twinkle in the distance, birds fly overhead and fish swim through the waters below. The idea is to get patients focused on anything but their cancer or the radiation treatment awaiting them. And it appears to be working. "I was amazed at how much more relaxed I felt at the end of 10 minutes," McCook said. "I was at peace." This screenshot depicts one of the scenes that cancer patients experience when using the virtual reality machine within Penn Medicine's radiation oncology department. Virtual reality offers health professionals a litany of possibilities, though the technology has been harnessed in a limited number of applications. So far, the technology is being used to reduce chronic pain, restore low vision and hasten recovery from brain trauma. Medical students have used it to watch surgical operations while physicians are gaining a better understanding of what seniors see and hear. Penn's radiation oncology department is embracing the possibilities presented by virtual reality. The relaxation machine in the waiting room is just the first step. 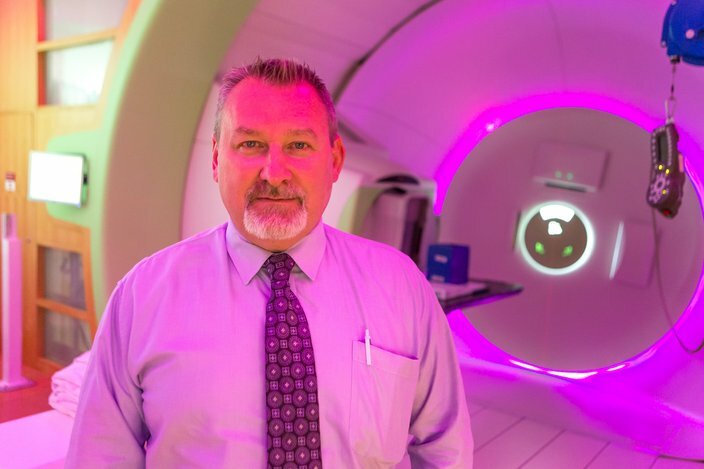 A virtual tour of radiation facilities is under development so patients can familiarize themselves with the facilities before their first treatment – particularly the massive proton therapy machines. Eventually, they also will be able to view educational videos regarding specific cancers. To do so, Penn Medicine will provide patients with a Google Cardboard virtual reality headset that connects to a smartphone. "We look at VR as another way to deliver education," said Dr. James M. Metz, chair of radiation oncology. "Some people learn by listening. Some people learn by reading stuff. Some people learn by watching a TV show. This is just another avenue for educating people in a variety of ways." Additional VR machines will be added to the waiting room, which soon will be remodeled as a more patient-friendly environment. Each of the machines will be enclosed within its space so patients will feel less exposed using them. And an additional machine will be added for medical professionals. "I figured our faculty and staff can benefit just as much from this," Metz said. "So in the next couple of weeks, we're building a private station back there so they can go in on their breaks and actually do it. ... We see the value of how much people have really enjoyed it." James M. Metz, chairman of the Penn Medicine's radiation oncology department, stands in one of Penn's five proton therapy rooms. The virtual relaxation machines double as a mindfulness exercise. In addition to transporting patients to a natural setting, an audio track guides patients through the experience, encouraging them to focus on specific sights – like the stars in the sky and the setting sun. "If you're actually doing that, by definition, you're not worrying about the future and you can't really be worried about the past," said Dr. William P. Levin, an associate professor of radiation oncology. "Your brain is actually concentrating on one task." That means the patients are not worrying about whether their cancer is spreading or their chance of survival. At least for those 10 minutes. But how much can virtual reality actually reduce stress and anxiety? "This is a very data-driven institution," Levin said. "We're talking about some very nebulous, esoteric practices here. I know that if I begin to sing the praises of this, people are going to say 'Prove it to me.'" Levin – who regularly practices mindfulness on his own – is leading research efforts to do that. He will examine various biosensors – including heart rate, blood pressure and respiration – to determine whether virtual reality leaves patients less stressed. He will measure the levels of cortisol – a stress-related hormone – and amylase – a protein – in the saliva for additional indications. Penn patients also are encouraged to complete a survey after they use the virtual relaxation machine, an effort to gauge its impact. So far, the results mostly have been positive, the doctors said. "A lot of patients come here – they're nervous, they're anxious, all kinds of issues," Metz said. "By just getting them to calm down, they can actually go through the (radiation) experience much easier." Michael Kent, an ambassador for Penn Medicine's radiation oncology department, tries to provide hope to patients by sharing his own cancer experiences. Michael Kent – a three-time cancer survivor – wishes the virtual relaxation experience was available to him earlier in his personal journey. 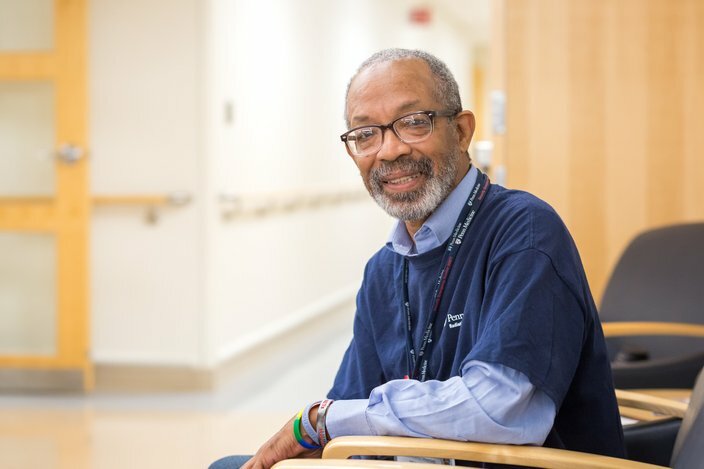 Kent, 65, of Philadelphia, serves as an ambassador for radiation oncology department, talking with patients as they come in for radiation treatments. Having beat colon cancer, abdominal cancer and prostate cancer, he shares the lessons he learned and a message of hope. As a patient, sitting in the waiting room was "very challenging," Kent said. "At first, it's a bit frightening," he said. "You begin to wonder. The 'what ifs' come in your mind. Is it going to work? And what if it doesn't? ... Without having someone with you, to talk to you, it can become a little uneasy." Kent first used the virtual reality machine shortly after it was installed. Now, he helps people use it. "It is absolutely wonderful," Kent said. "It releases and takes away all that anxiety that you may have in your mind. It gets you into a place and a state that is, again, very relaxing and very fulfilling. "It wasn't available when I was going through my cancers, but right now, it's great."